For 13 years, owners Robert and Laurie Williamson have quietly created their slice of paradise on 300 acres just outside of Valera, Texas. Rancho Loma has been on my radar for some time now. Dear friends Bruce and Jana Colgate and Tom and I finally made the effort to book a two night stay there. We also booked a seating for a wine dinner which was held at their pizzeria in nearby Coleman. Rancho Pizzeria serves very fine pizzas, salads, appetizers, desserts, wine and beer. An old repurposed warehouse makes a great backdrop for this minimally stylish restaurant. Adjacent to the pizza space is El Centro, a retro-vibed coffee shop serving cookies, muffins, scones and sandwiches. Future plans for the ambitious couple include a wine making facility, wine bar and brew pub. Back at the ranch, a short drive from Coleman, are 300 acres, an old rock house (where Laurie serves a fixed price menu Friday and Saturday evenings), six super cool rooms (think Dwell magazine) for lodging and a vineyard (now under construction). Ancha and Rio, brother and sister canines, supervise the ranch overseeing a bevy of chickens, roosters, pigeons, longhorns and more. Let’s just say our stay there was lovely and warrants a repeat visit when temperatures will be warmer making their soaking pool more inviting. The wine dinner featured Texas wines including Comfort’s much admired Bending Branch Winery. Chefs Laurie and Cliff served the sold out crowd a well executed palate of flavors. This is a place to go for reflection, for culinary adventure, and for slowing down a bit. Enjoy the photos. Highly recommended. Place about a 1/4 C of olive into a preheated soup pot. Place rosemary into oil and allow some sizzle. You are perfuming the oil! Add onions, carrots, celery and garlic. Add a generous spritz of salt and pepper. Sauté vegetables until they soften. Add tomato paste and continue to sauté over medium heat. Some sticking to the pot is desirable. Just no burning. Once the color darkens and sticking occurs, add white wine for deglazing. Increase heat and bring mixture to a boil. Lower heat and add beans, red pepper flakes, cloves, bay leaves, parmesan rinds and chicken stock. Through a fine mesh strainer, add mushroom soaking liquid to pot. Chop softened mushrooms and add to pot. Bring this mixture to a boil. Lower heat and cover. Cook until beans soften. Once beans soften, add chorizo, sun-dried tomatoes and kale. Continue to cook over low heat until tomatoes soften. Adjust seasoning with salt and pepper. Serve soup with an additional sprinkle of parmesan cheese and chopped fresh rosemary. Have you bought your tickets yet? The concert/buffet is a special evening which benefits our local boys and girls club AND puts you in the Christmas spirit. Seating is limited. The champagne buffet is delectable. Generous underwriters offset the various costs for the evening allowing the full ticket price to go directly to the club. Purchase your tickets today at High’s Cafe & Store. Highmadefood recommends these recipes for your Thanksgiving Holiday! 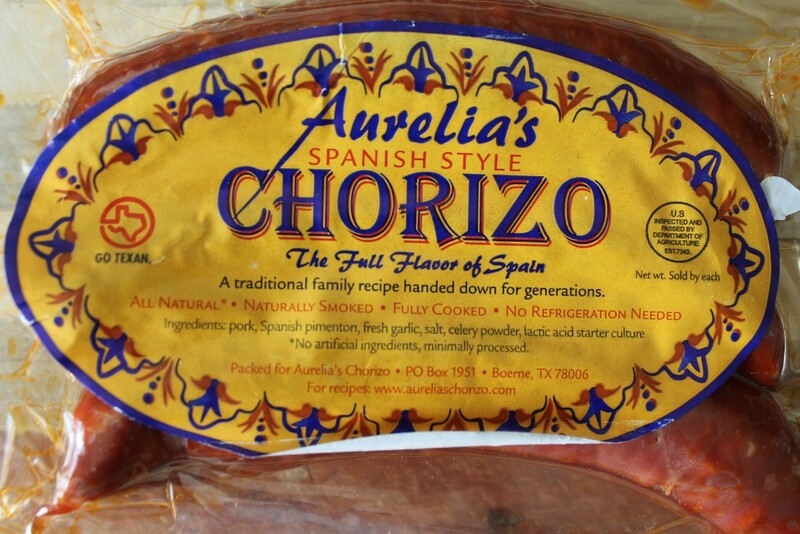 Try this as a substitute for Mexican rice. It is delicious and a healthier option. In a preheated sauté pan, add olive oil. Swirl it around. It should travel easily around the pan. Add onion, a spritz of salt and cracked pepper. Sauté until onion begins to soften. Add garlic, corn kernels, chili powder, cumin and salt. Sauté until spices and garlic become aromatic. Add quinoa, water and lime juice. Bring mixture to a boil. Cover, lower heat and simmer for 12-15 minutes or until liquid has absorbed. If serving right away, add cilantro and dig in. Quinoa can also be spread onto a cookie sheet for cooling and service later. When ready, reheat in the micro or stove top and add fresh cilantro. HELP US CELEBRATE 10 YEARS IN COMFORT! Ma and Pa High can’t believe 10 years have rolled by. Help us celebrate this milestone. We could not have made it without you. Let us thank you with an ultimate customer appreciation BASH! Join Denise and me along with our wonderful High’s team August 30, 4-8 PM. Don’t forget the lawn chairs. Let’s turn High Street into a party scene!!!! So I had about a quart of locally grown/organic okra, a ripe tomato, an onion, garlic and half of a red bell pepper. What do you make with that? Okra gumbo of course. I also had some smoked basmati rice. Check it out. It really is tasty with certain foods. Saute thin slices of onion, red bell pepper and slivers of garlic in olive oil. Add a spritz of salt and pepper. Add a couple of tablespoons of tomato paste. Saute until some sticking occurs. Add okra, 1 t of smoked paprika, 1 t of curry powder and 1/2 t of red pepper flakes. Add enough water to simmer. Cover and cook over low heat until flavors meld. Add additional salt if needed. Prepare rice according to package instructions. Add cooked rice to okra mixture. Top with fresh cilantro. This is yummy. This is so filling that it makes an excellent one pot meal. Serve with a salad. Good use of summer okra. Ma and Pa High can’t believe 10 years have rolled by. Help us celebrate this milestone. We could not have made it without you. Let us thank you with an ultimate customer appreciation BASH! Join Denise and me along with our wonderful High’s team August 30, 4-8 PM. Don’t forget the lawn chairs. Let’s turn High Street into a party scene!!!! This annual concert/party has become the must see/hear/taste event of the year. 25 professional musicians will gather… all in excellent voice, tuned instruments ready for the downbeat, and our wordsmith Douglas Skrief performing much-loved folk tales. Be a part of this intimate gathering (we only sell 200 seats) and allow the music to wrap you in sound, allow the words to speak to your soul…feel the energy. Every year, audiences leave with grateful hearts and big grins. Every year is a sell out. Every year musicians from all over our state come to Comfort freely giving their talents and time for a great cause…feeding people. Every year, generous host families house our performers allowing all proceeds, every dime, to go to The Comfort Table. Additional underwriters cover miscellaneous expenses. 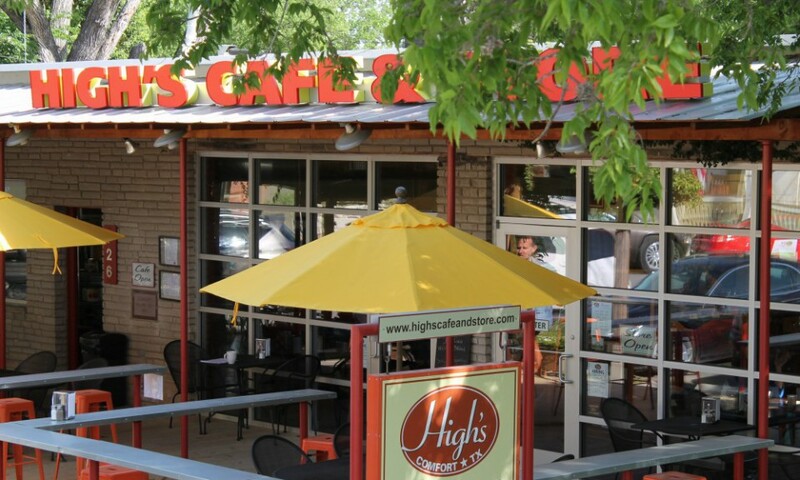 High’s Cafe & Store, your main event sponsor, throws a big bash at the conclusion of the concert. Live music, beer, wine and great nosh – all complimentary as we continue to celebrate the evening’s many blessings. So, don’t delay. Purchase your tickets today at High’s. We can only accept cash or checks (made payable to The Comfort Table). $40 per ticket helps raise half of the annual budget for The Comfort Table. Your purchase is tax deductible. Come see what small towns do best: we support each other, we support our worthwhile causes and we celebrate our community. This really is just another delicious secret from Comfort! Shhh. My trip began at this tasty eatery in Phoenix. A small chain out of Colorado that does it right. Great decor, very tasty food, vibe, music, servers. All good. There’s something about traveling that makes me want a Bloody Mary. Their concoction was stellar…very herbaceous and spicy. Sweet Potato Pancakes with Maple Syrup and Candied Pecans. YUM. Not a bad view from the hotel. Nice craft cocktails and scenery that is mesmerizing. Three cocktails later, I was glad my room was within walking distance. Nice Quinoa Salad. Perfect afternoon snack while gazing at the big red rocks. Took Oak Creek Canyon Drive to Flagstaff. Beautiful. I have never heard so many different languages spoken in one location. Truly an international destination. Awesome and humbling. Prescott, Arizona is a happening town. Great courthouse square with shops and funky cafes. I enjoyed “The Blue Cat”. Palm Springs is an oasis in the desert. Restaurants, nightlife, mountains and a mid-century vibe. Took a great architectural tour and dined in several good places. The standout was Johannes. Delicious meal. Coastline at La Jolla. Delicious lunch at George’s with a good friend. Spectacular view. Best fries ever! Really. Leroy’s Kitchen in Coronado. Had two orders. Loved strolling the streets and neighborhoods in Coronado. Pricey real estate. Fabulous weather. Farmer’s Market in Little Italy. Overflowing displays of gorgeous, organically raised vegetables. Cheese vendors, bread makers, baristas, taco vendors, beer on tap, musicians, gorgeous flowers…so much for the eye and appetite. A MUST DO. BALBOA PARK…amazing…1200 acres of urban green space: fountains, gardens, museums, theaters, restaurants and the famous San Diego Zoo. Most of the buildings at the park were built for the opening of The Panama Canal. Beautiful, ornate carved stone. The Tony winning Globe Theatre. Three performance venues. Who couldn’t spend the day here? Had a nice lunch at The Prado. Lovely patio dining. Spreckels Organ Pavillion. It was Flag Day and I heard patriotic fervor from the pipes. The instrument is soon to be the world’s largest outdoor pipe organ. I guess you can tell that I was most impressed with this park. Such a treasure. Anyway, back home now and back in the kitchen. More recipes coming!!! !